The sounds of Motown are in my head, but I’m hearing R-E-C-Y-C-L-E instead of Aretha’s amazing voice and R-E-S-P-E-C-T.
I’ve been on a recycling toot ever since I learned how to sew a Belgian secret binding from Hedi Kyle. The workshop was at Shakerag some years ago, and I seem to remember an abundance of liquor. 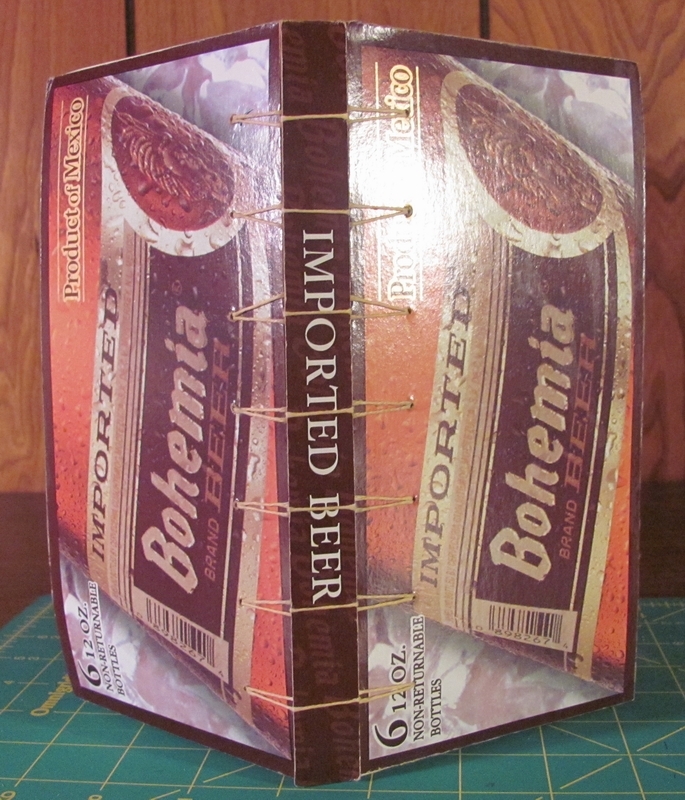 There were a lot of cardboard beer cartons in the recycling bin, and some of us decided to salvage them and use them to try out our newly acquired bookbinding skills. 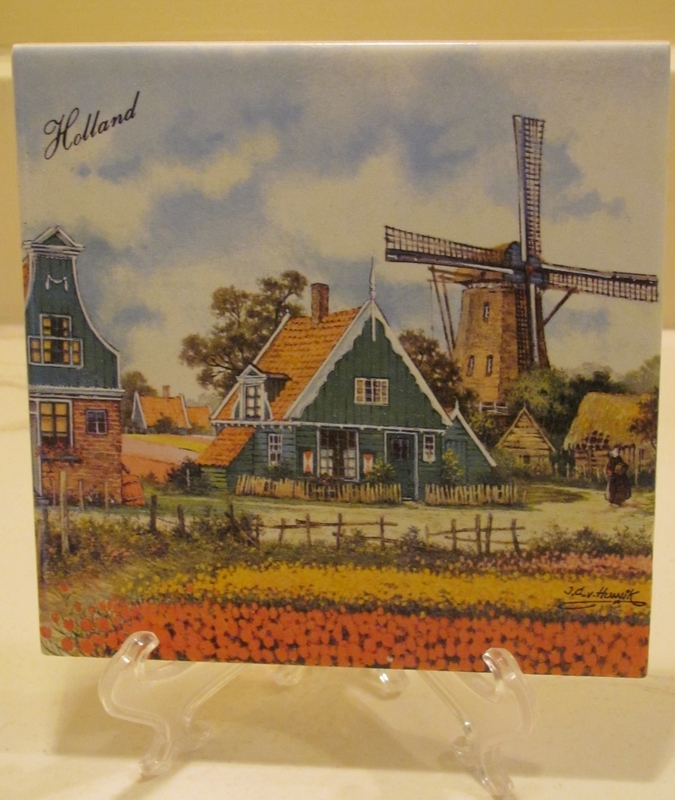 I used the Belgian secret binding again with recycled pages from an old art museum calendar. I cut the pages into strips then wove them to make a front and back cover. 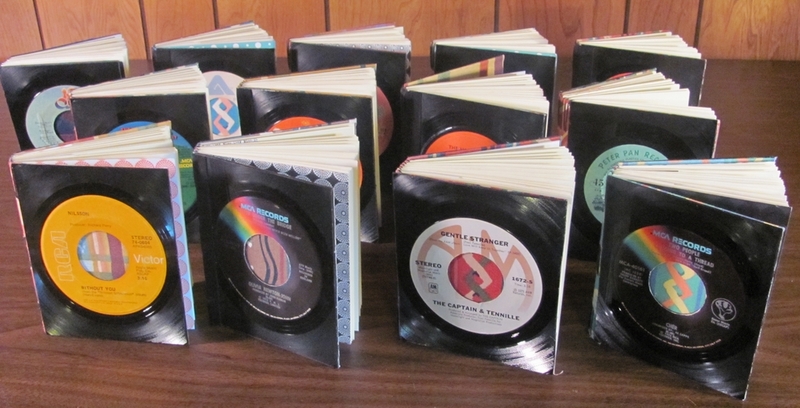 For some upcoming art/craft shows, I will be selling these mini books which I made from old scratched up vinyl 45 rpm records. 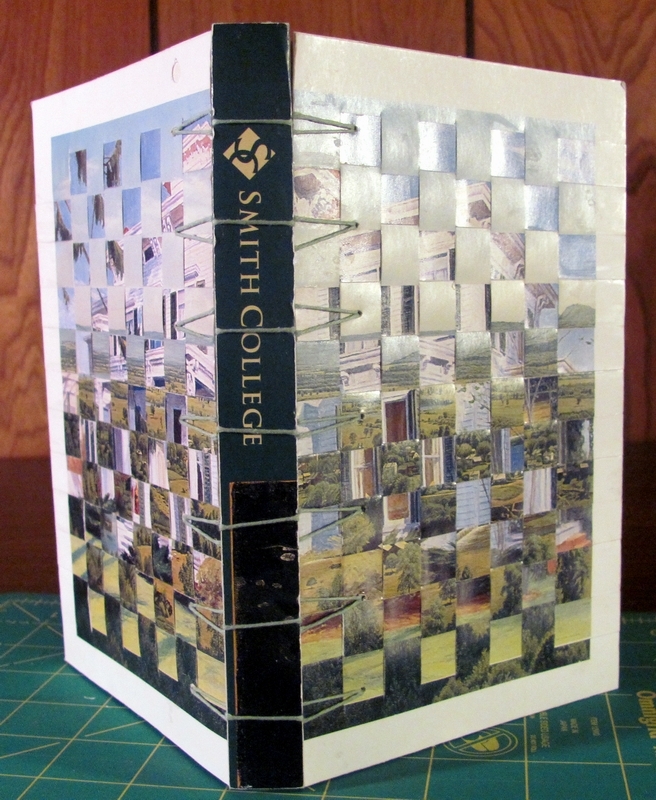 For the spine and lining, I used fabrics from discarded sample books. 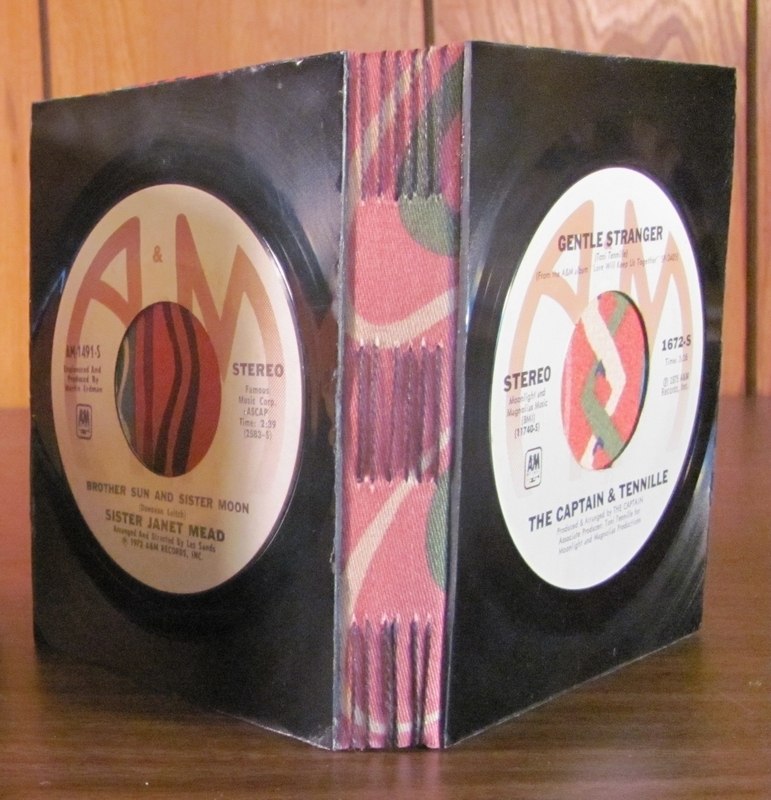 Some had a binding made from ultrasuede scraps leftover from previous projects. I used a simple long stitch to sew the signatures to the spine. 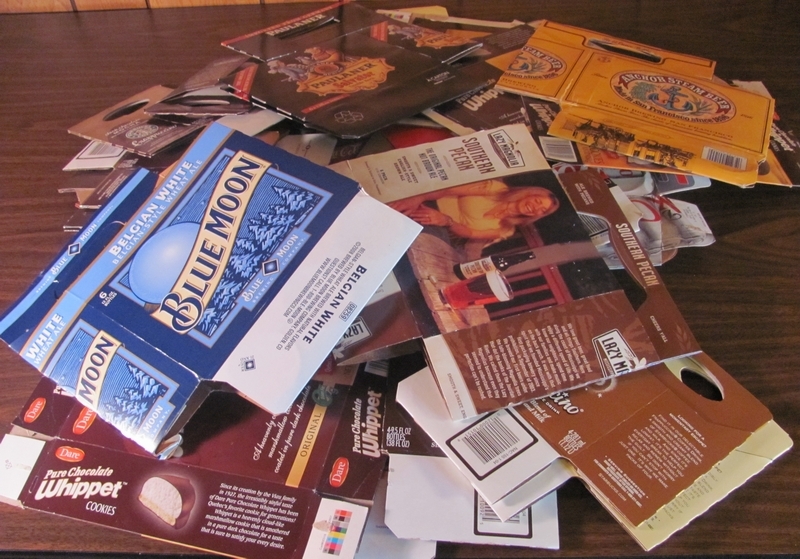 So instead of placing my beer cartons and cardboard packaging in the recycling bucket, I’ve been saving them with the intention of binding them into books. Looks like I have some work ahead of me. For those of you who want to try this at home, Re-bound by Jeannine Stein has some excellent ideas and examples plus clear diagrams and instructions for your own creations. 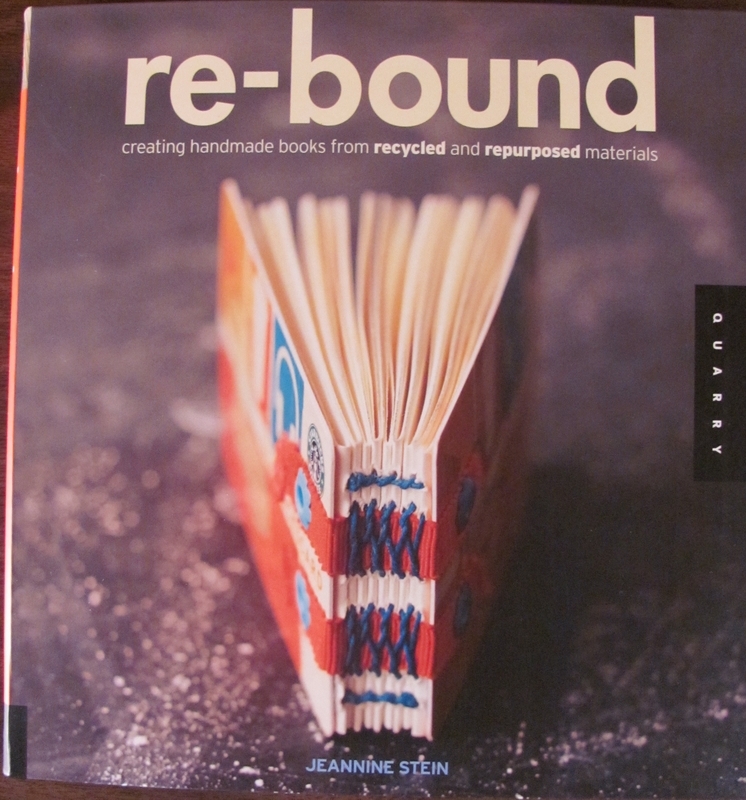 Re-bound can be purchased here. This scarf came about by mistake. A simple mistake. An elementary one, really. 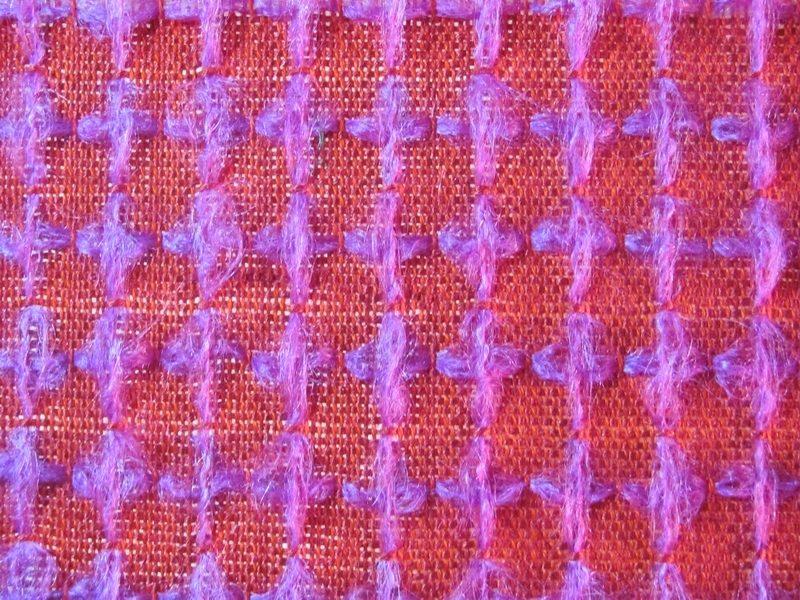 Against my better judgment gained from 30 years of weaving, I used a loosely spun novelty yarn as a supplementary warp that would sit or “float” on top of the woven fabric and then anchored down by a weft row every 12 picks. And of course as I was beaming the warp, the novelty yarn began to break and unravel causing a major headache and a few choice words on my part. So I carefully removed the novelty yarn and continued to wind the 10/2 perle cotton warp minus the supplementary warp threads which were meant to be spaced at every fifth dent in an 8 dent reed. The 10/2 perle cotton was sleyed at 3 ends per dent for 4 consecutive dents, then the fifth dent for the supplementary novelty yarn remained empty. And so this pattern of sleying continued for the width of the scarf which was 7 inches. I needed a replacement for the heavier novelty yarn. 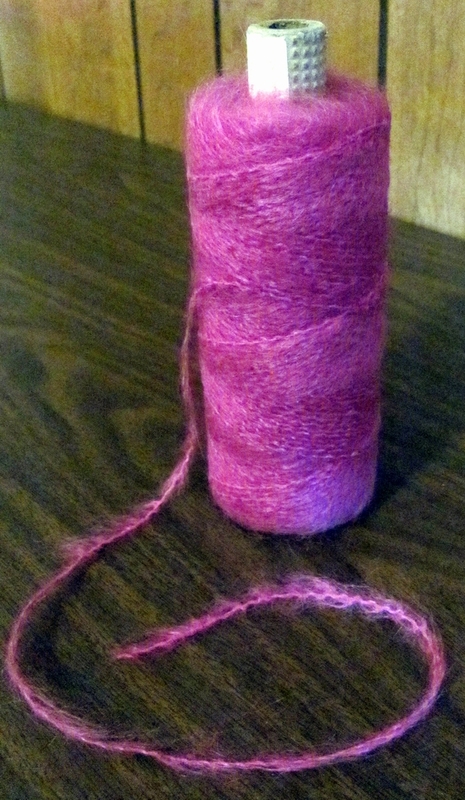 A quick look at my yarn shelves revealed this little used cone of fuchsia mohair and nylon yarn. I wound 12 ends of this mohair yarn, each measuring 7 1/2 yards which was the length of the original warp. The ends were threaded through the empty dents and heddles that were reserved for the supplementary warp yarn. Because the 10/2 warp was already tied and wound onto the the warp beam, I had to improvise with the mohair yarn. The entire length of each of the supplementary warp yarns were wrapped around small squares of plastic needlepoint canvas weighted down with a washer. 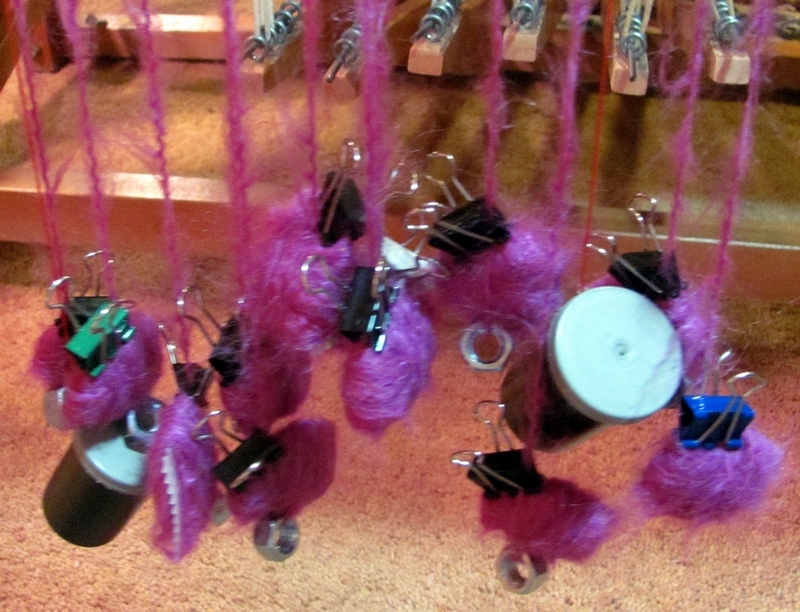 A small “Boston” clip was used to keep the yarn in place and to prevent unraveling. These were hung over the loom’s back beam. It looked rather messy, but it worked. This was a true “McGyver” moment! The two film canisters held ends of 10/2 perle cotton that happened to break during the beaming and so also needed replacements. 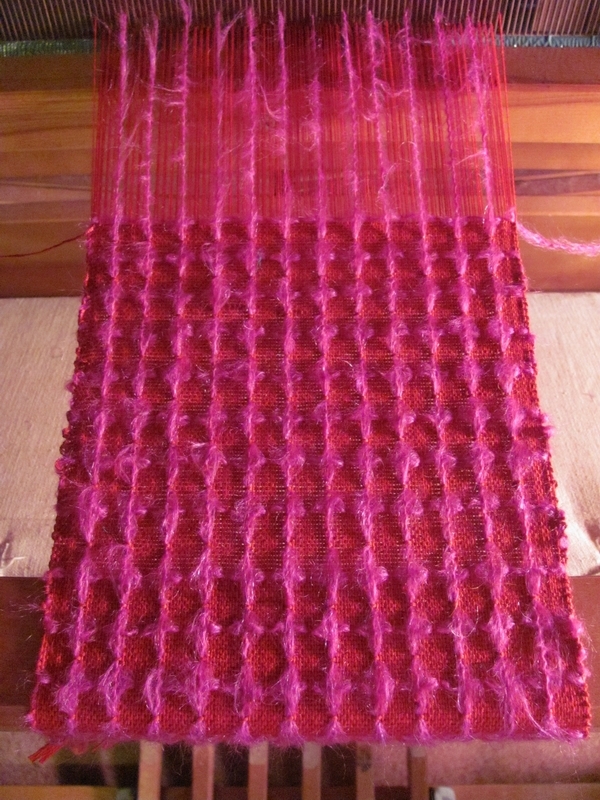 During the actual weaving, the scarf had a supplementary weft yarn that was inserted after every 12 picks. I used the same mohair/nylon yarn for the supplementary weft. The choice of colors to me wasn’t an ideal one, but given the selection of my yarn stash, it seemed to work better than anything else that was at hand. This was a simple and easy solution to a very frustrating problem. And I was reminded that I always tell my students that 75% of weaving is trying to figure out how to solve a problem. In this case, the problem was my mistake and short sightedness. It’s all supplementary, I mean elementary isn’t it? Do you know about saucijzenbroodjes? (so-sise-en-bro-chess) The literal Dutch translation would be small sausage breads. 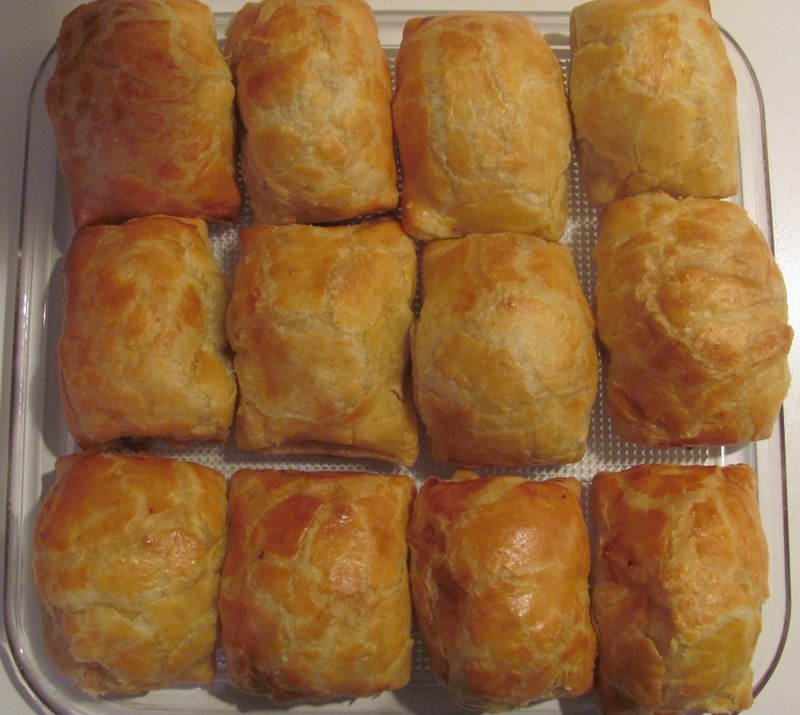 These are appetizers of puff pastry stuffed with a filling of a spicy ground meat mixture. These aren’t your run of the mill “pigs in a blanket” as the meat flavoring holds a blend of exotic spices. The Dutch after all were early settlers of the Spice Islands which would become a part of the extensive Dutch East Indies Empire and are now part of the archipelago of Indonesia. 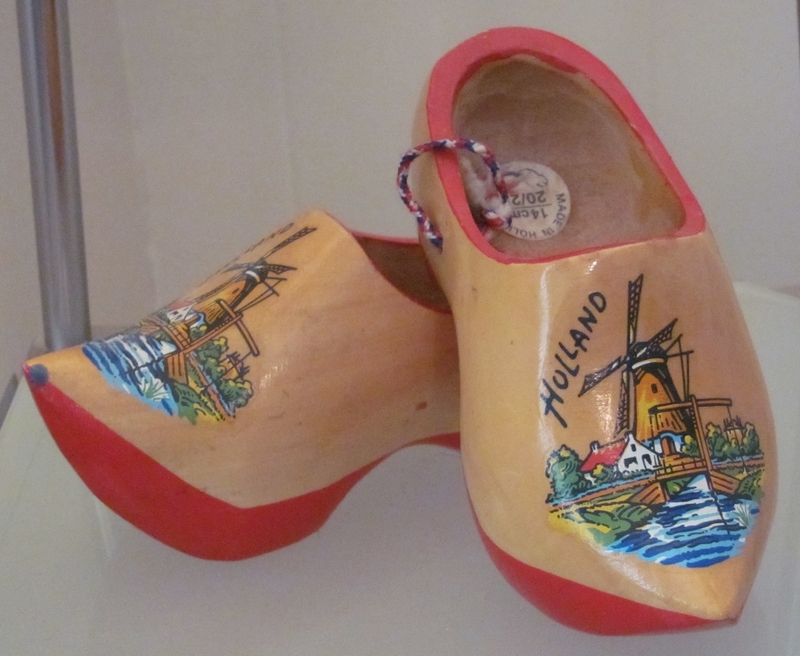 Weaving and Holland have a long history together. The medieval art of the handwoven tapestry comes from the northern European region once known as Flanders and today is an area that includes France, Netherlands and Belgium. Perhaps it is because of my Dutch ancestry that I am a handweaver. But I do know that it is because of my Dutch heritage that I enjoy saucijzenbroodjes. And so I shall share the recipe with you. A special thanks goes out to my friend Zita who sent me her recipe and with her blessings, I altered it a bit. In a large bowl, mix the ground beef and pork with all the spices, bread crumbs and the two beaten eggs. Mix well and then form 24 – 2″ meatballs. Unfold the pastry sheets and cut along the fold lines. Then cut each of these sections in half so that there will be a total of 24 rectangles. Place a meatball on each of the pastry rectangles. Fold the narrow ends of the rectangle over the meatball until they meet and slightly pinch the seam closed so it won’t separate during baking. This seamed side will be the side that sits on the parchment paper. The ends of the pastry can be left open so the meatball is exposed, or the ends can also be pinched shut as in the saucijzenbroodjes in the above photo. Line two cookie sheets with the parchment paper, and place the saucijzenbroodjes on the paper so that their sides don’t touch. Meanwhile, beat the third egg and with a small pastry brush, brush the egg on top of the saucijzenbroodjes. Bake for 25-30 minutes or until golden brown. Zita says to check the bottom of the saucijzenbroodjes to be sure they don’t burn. These can be served hot or cold, and they can be kept refrigerated for three days. They can also be frozen then reheated and they’ll be ready to eat. Saucijzenbroodjes are best eaten with spicy brown mustard. They can be eaten as an appetizer or a meal by itself with a side salad or soup. And don’t forget the Heineken! Smaakelijk eten! Until next time when I’ll return to the subject of weaving!